FYI - the Dutch side of Sint Maarten is really cracking down on cruiser's and their dinghies. The Dutch Coastguard has been stopping cruisers at night as they dinghy around the Dutch side of the lagoon to check and see if they have their all around white light and flares. They have given stern warnings to some and expensive tickets to others. Gossip has it, they gave one lady a ticket only a short distance from a dinghy dock. She had just set out and had her all around white light on board the dinghy but had not yet put it up. She tried to tell them this, but they wouldn't go for it and gave her a ticket. While most states in USA have strict dinghy requirements, down here we have not really run into any. Or at least any that are enforce....until now and therefore this has cruisers here in a bit of a tizzy. Finally, the French side of St Martin doesn't really seem to care if dinghies have lights at all, thus the numerous dinghies flying through Marigot Bay at various times of night with NO lights at all. Yeah - it happens quite a bit. 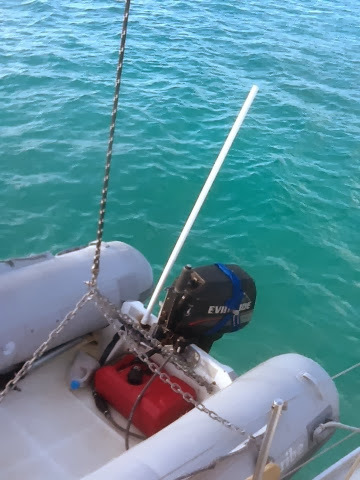 Thanks to our good friends Tim and Kim, we have awesome red and green clip on lights along with our all around white light on the dinghy. Many have asked about these kewl lights. They are not required but really help other dinghy and boaters see us at night. Additionally, we look really nautically official so hopefully we won't get stopped by the Dutch Coastguard and asked about our non-existent flares! 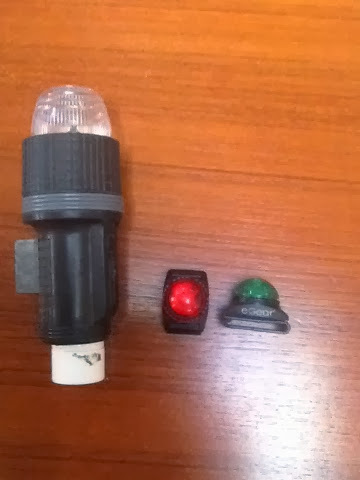 I don't know where our friend got them but they are Egear and say Adventure lights on the back. They clip on and off.